TWS made planning my wedding a breeze! Working with the various experienced and trusted professionals of the the Tulsa Wedding Society made planning my wedding a breeze! Not to mention, a $100 check for joining the Passport Program! I would hire you again in a heart beat. the wedding to discuss any and all concerns I had about the day, and came up with many suggestions to help the day be more organized. wedding. There was not one detail left untouched, thanks to Sharon. I absolutely loved having your presence at the wedding, and I would hire you again in a heart beat. I recommend her to everyone I know! Thank you SO incredibly much for being so amazing. 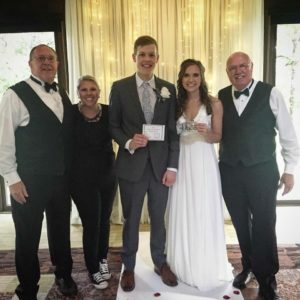 One of the best parts about working with Sharon and her extensive knowledge of everyone within the Tulsa Wedding Society was the surprise about being a passport bride. 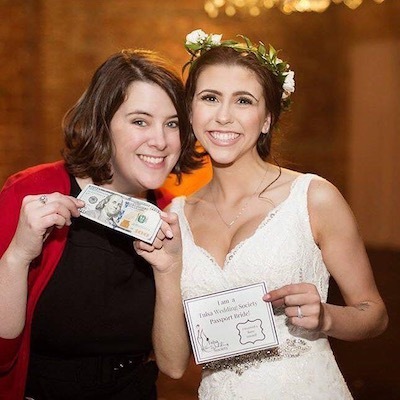 After telling her all my wedding professionals, she shared the news with me that my husband and I qualified for receiving a free $100 just for using several members within the Tulsa Wedding Society. My husband and I went to a Tulsa Wedding Society event shortly after getting engaged and all the vendors set a professional but fun atmosphere that made us excited to plan our wedding and choose our vendors. It was comforting knowing my husband and I were working with a group of experienced people that knew each other and worked well together. It made planning our wedding painless. Andrea Murphy took timeless photos that we can cherish for the rest of our lives. Sharon Holm from Tulsa Weddings and Design took the stress off me and my family during planning and on the day of my wedding. Hugo from Lionsroad Studios was an amazing DJ. He made the night so much fun by getting everyone on the dance floor and interacting with all my family and friends. Ms. Laura’s made my wedding cake and it turned out even better than I imagined in my head. She made a beautiful geode cake that was picture perfect. I appreciated the services everyone provided and all of their upbeat personalities. It was a tremendous perk that my husband and I received $100 from using 3+ of their vendors! I am very thankful for the Tulsa Wedding Society.